If you have been impacted or blessed in any capacity by Bishop Abraham Shanklin Jr., please join us in honoring him at our Fruitful Legacy Banquet. 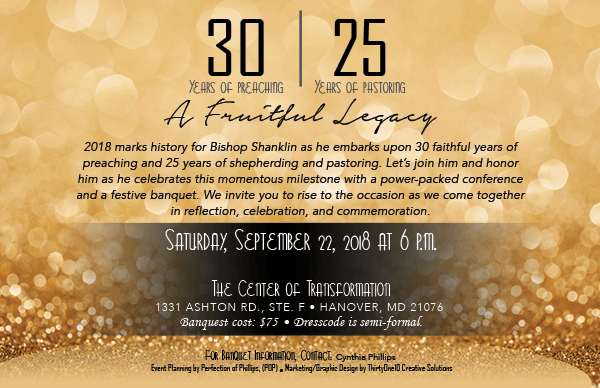 2018 marks history for Bishop Shanklin as he embarks upon 30 faithful years of preaching and 25 years of shepherding and pastoring. Let’s join him and honor him as he celebrates this momentous milestone with a power-packed festive banquet. We invite you to rise to the occasion as we come together in reflection, celebration, and commemoration. At our celebratory banquet we will be ordaining some of our fellow ministry leaders, while enjoying a 3 course meal provided by Perfection Of Philips, LLC Event Planing. Some Light Jazz Music will also be provided Following JLashawn Tillery-Williams who will be singing lead in worship. Go to http://www.legacy3025.org or click the button “Fruitful Legacy Banquet” at the top to purchase your tickets now!